[Fast Charging and Sync]: USB-C Cable Transfer speed up to 5 Gbps, 3A Fast Charger, Data Transfer and Power Charging 2 in 1. 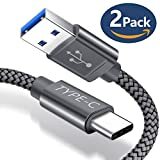 [Compatibility List]: This USB Type C Cable can fast charge and sync well with Samsung Galaxy Note 8,Samsung Galaxy S8/S8+, LG V30,V20, G6,G5, Moto z, Moto z2,Google Pixel XL,Nintendo Switch and More. [18-Month Warranty]: We provide this 6.6ft Nylon Braided USB 3.0 Type-C Cable with 18-Month Warranty and 24/7 customer service, if you have any questions,we will resolve your issue within 24 hours. Cautious: JSAUX USB-C Cable is sold by JSAUX Digital only, to avoid fake products, please choose carefully. If you have any question, please email us, we will resolve your issue within 24 hours. Transfer data speed up to 5Gbps, this allow you to download an HD movie or 1000 songs every 5 seconds. Charging speed up to 3Amps, this allow you to charge your phone in the fastest way.